Threatening to hang the fifty-eight-year-old man and to harm his family if he did not cooperate, Adolf Hitler forced an Austrian inventor to build a flying craft which levitated without burning any fuel. The inventor had previously produced electrical power from a unique suction turbine by the same implosion principles, using air or water in creating the force. The Third Reich wanted these inventions developed quickly. But the inventor took his time; understandably he did not want to give Hitler a technological advantage. 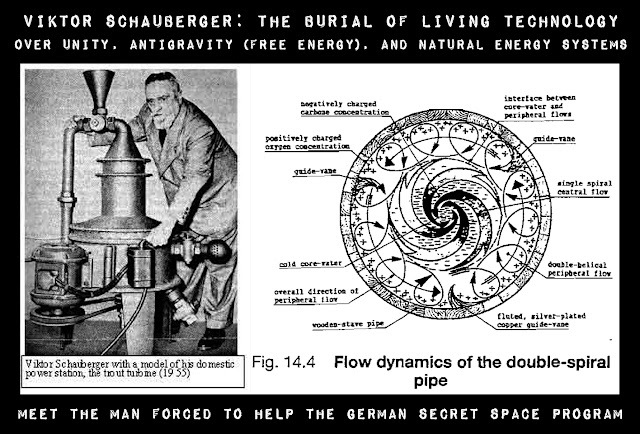 The Austrian, Viktor Schauberger, was known in his time as the Water Wizard. The courageous inventor built prototype examples of beneficial technology, in his effort to turn humanity away from death-dealing technologies. He defended Earth's water, air and soil, but at the end he was out-maneuvered by people with lesser motives.